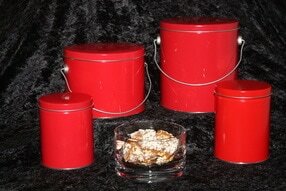 ​Toffee Lady specializes in old fashioned English Toffee, like your grandma used to make. We started making our English Toffee over 15 years ago, using a recipe that was in our family, made by my Nana. The holidays were always something to look forward to, and we always enjoyed her melt in your mouth English Toffee. We use quality ingredients and no preservatives when making our hand made English Toffee. Since we are a family run business, we know that every batch of our English Toffee is made the same way, and that we are providing you with the best tasting candy possible. Many people say that English Toffee is their father’s favorite candy or they might not know what to get for that hard to shop for relative. Toffee Lady can take the guesswork out of your gift giving this year and it can become a tradition in your family, like it is in ours.